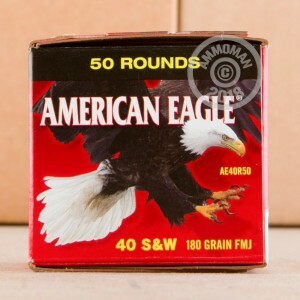 When you need a good range training or target practice ammunition, make sure you have some 40 S&W Federal American Eagle rounds handy. These 180 grain full metal jacket projectiles deliver the accuracy and precision you expect from trusted industry leader, Federal. They are priced for the high volume shooter, making them a great product to fire round after round for minimal cost. Great ballistics will be recognized with this ammunition, with a muzzle velocity of 1000 feet per second and muzzle energy 400 ft/lbs. 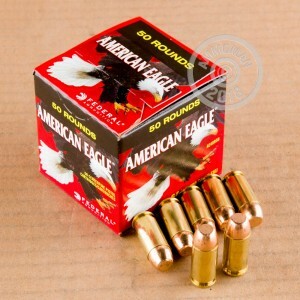 The cartridges have a brass casing which allows for a smooth feed into your rifle. Dependable Boxer-primers and clean burning powders make ignition consistent and don't leave too much residue in your barrel. 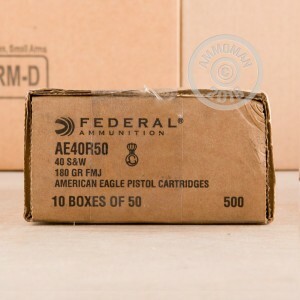 With your order, you will receive 500 rounds of brand new 40 S&W Federal American Eagle ammo. You save money when you buy in bulk and get to take advantage of free shipping! Federal brand ammunition is a favorite among shooters all over the globe. With a long, rich history dating back to 1922, you can't go wrong with their products. They are headquartered in Anoka, Minnesota where they manufacture shotshell, centerfire, and rimfire ammunition and products. Shoots just fine my only squabble is that they came in small 50rd boxes that seemed awkward. As long as you know what you want, ordering here will never disappoint. Had a range trip sneak up on me and needed ammo. Called and was told an exact date and time it would be shipped if I placed it that day. Arrived on time and enjoyed shooting it at the range. Will continue to buy bulk from ammoman. Great quality, and a much better price than you'll get at the range!